Historians of France have now been talking about the ‘Vichy Syndrome’ for some time, and one of the recurrent themes of this roundtable was whether the force of that fixation still holds. 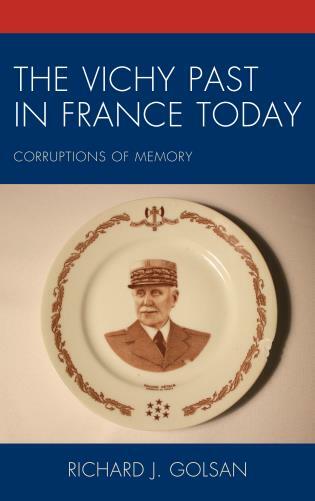 Addressing this question head on, Professor Richard J Golsan (Texas A&M), funded by a Visiting Scholar Grant from the Society for the Study of French History, introduced his book The Vichy Past in France Today: Corruptions of Memory (Lexington Books, 2017). Golsan (see his profile for the FHN here) introduced his idea of the ‘corruption of memory’ and how the history of the Vichy past had become a ‘collage of its own toxic residues’. Within the debate, he noted, Vichy had become a metaphor for general political and moral evil. This had led conversations around this memory to become sterile repetitions of past debates that didn’t accrete meaning but instead became, so to speak, a memory of a memory. Charting the ‘Mode rétro’ of the 1970s fascination with the Vichy past, and its revival in the 1990s, Golsan described an endless dialectic between over-celebration and revision, in which reconciliation becomes an obsessive impulse to draw together resistance and collaboration across politics and literature. Dr Joan Tumblety (Southampton) was the first respondent, talking about the ways in which she had encountered and explored this memory of Vichy in her own scholarship and teaching. Tumblety stressed first the importance of analysing the rhetorical strategies of political actors when they engaged with the memory of Vichy, from the attempts at exoneration pursued by Brassilach’s brother-in-law Maurice Bardèche, to the polemics of Renaud Camus (and especially the latter’s proximity to the ‘Le Pen moment’ of 2002). Tumblety stressed that these polemics were intended to be participatory affairs, and that the work of someone like Henri Rousso showed the importance of historical comparison as a means of dealing with the past rather than simply relaying it to others. She cited reactions to Jonathan Little’s Les Bienveillantes (Gallimard, 2006) as a sign of the value of historical comparison as a rhetorical strategy to contemporary political actors, though questioned the worrying direction of this trend in the wake of France’s latest ‘Le Pen moment’. Professor Hugo Frey (University of Chichester) set out with the challenging proposal that the ‘Vichy syndrome’ had been played out, and that in a pop-art style repetition, its existence after 2015 had seen it refracted through a lens of abstraction that had altered its meaning. The ‘original’ spanned the unresolved debates that followed the shattering of the post-war consensus, whereas the ‘copy’ became about settled partisan debates in which controlled narratives and brand management prevailed over new intellectual debates or political scandals in relation to the Vichy past: the micro had replaced the macro in these conversations. For Frey, the Vichy past in France today can perhaps best be understood as a study of communication, between the production and reception of its imagery, and the sensitivity and scale of its impact. Professor Golsan responded that Rousso’s ‘Vichy Syndrome’ had become a lieu de mémoire itself, and that its impact had changed how different disciplines worked. He spoke of similar patterns of the ‘corruption of memory’ around the issue of the legacy of the American Civil War, in which contemporary debates around erasure and revision demonstrate only an episodic engagement with history, and in which iterative discussions could not usefully accrete meaning but were instead trapped in self-referential and often partisan stances. Discussion revolved around how the painful relay of these memories through the lens of contemporary politics and literature showed evidence of the corruption of memory, and how the study of rhetorical strategies offered the most likely tonic to the enduring malady of memory.